During the warm-weather months, I was so excited to be able to spend so much time outdoors with my mister. He was so much more active and interested compared to last summer. As much as he loves a long walk in the stroller, he’s quick to take me up on the offer to play at the park or the pool. 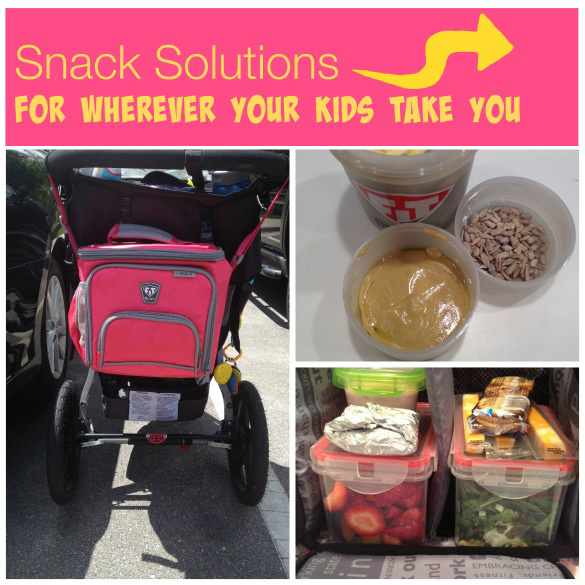 My kid has an appetite just like his daddy; in fact, when my husband and I got engaged, my mother-in-law told me her best advice for me was to always carry a snack! The same holds true for Evan. When it comes to being outdoors, I always pack a cooler full of healthy snacks to replenish my active toddler. So I was super excited when fitmark sent me The Box ($59.99) to try! They originally won me over by sending the product to me in pink, especially since most of what I see in my house is blue, but its usefulness made me a true fan. fitmark markets the brand in a way that supports managing one’s diet, helping to make sure that the necessary food and supplements are available and kept fresh. I have an ENTIRELY different need and take on this product, and I have to say, it is absolutely amazing and a must-have for every mama on the go for road trips, play dates and picnics! This portable, lightweight box comes with large and medium cooling packs to keep the well-insulated cooler bag nice and cold. Also included are two large seal-tight containers and a 20-ounce shaker bottle with custom vitamin organizer and meal mix compartment (all plastic is BPA-free!). Although my little guy is not a protein-drinking machine, I can see this being extremely helpful for formula-fed babies. I chose to use it another way: I packed a yummy salad for myself and put the dressing and toppings in the bottom. No one enjoys a soggy salad! As silly as this sounds, it worked perfectly! Each of these containers stack nicely and the shaker bottle slides in with ease next to the containers. There is an exterior pocket to fit a water bottle and an interior pocket to store utensils, napkins, prepackaged snacks and sunscreen. Yes! I put my sunscreen in there to keep it from getting too hot for when I needed to reapply. Brilliant, I know (*bowing*). Something I found so perfect for us mamas was the rear elastic fasteners and shoulder strap. This was designed for the busy traveler who schleps luggage, and I fell in love with it when pushing my BOB (which we all know has the smallest undercarriage storage known to ALL strollers, yet it is my favorite stroller!). I had so many other park essentials stuffed under the carriage, so I strapped The Box to the handlebar just below my bottle and whatever else I needed. This was not the most convenient way to hang it, but it was the most helpful to keeping my hands free. (Again, brilliant!). I probably could have taken off our storage compartment from the BOB because there is a front pocket on The Box for keys, a wallet, extra snacks and a cellphone. Pretty nifty! When I got home from the park I was bummed to see I didn’t seal the shaker bottle all the way and my leftover dressing leaked in the bottom of the bag. I used a wet paper towel and it wiped up easily. No leftover residue, no compromising the material. I also placed all the containers in the top drawer of the dishwasher — a mama’s best friend! I am in love with The Box for outings and so is my son. He’s able to carry it into the house for me, so it’s toddler-friendly too!